FingerWorks ReVu, a real-time telestrator for live sport and e-sport productions from FingerWorks Telestrators, was once again used by Valve Corporation for online coverage of its gaming tournaments. The Defense of the Ancients (DotA) final tournament, which took place August 20-25 in Vancouver, utilized FingerWorks ReVu as a quick and easy way to analyze gameplay between live battles, much like a sports analyst might review football plays during a huddle. 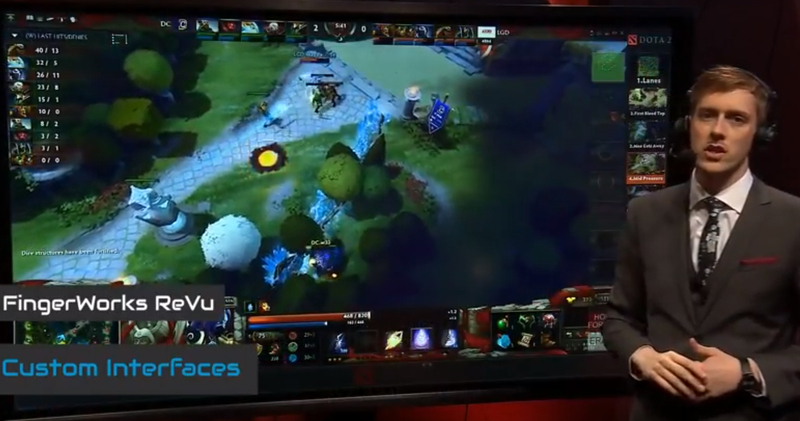 Now in its fourth year of partnership with FingerWorks, Valve also utilizes the system for regional DotA events throughout the year. In addition to live gameplay analytics, the gaming company also benefits from FingerWorks’ network connectivity, which enables them to augment with additional systems for countries covering the event in other languages. The FingerWorks ReVu provides real-time telestration for live sport and e-sport analysts to access imported clips and backgrounds from the event, which they can control and manipulate through its user interface to show targeted playback. By merging live clips and still image ingest into one seamless operation, the FingerWorks ReVu offers an ease of operability. The software provides a customizable user interface and tools — more than 100 to select from — and supports 4K using NDI or 12G SDI streaming.